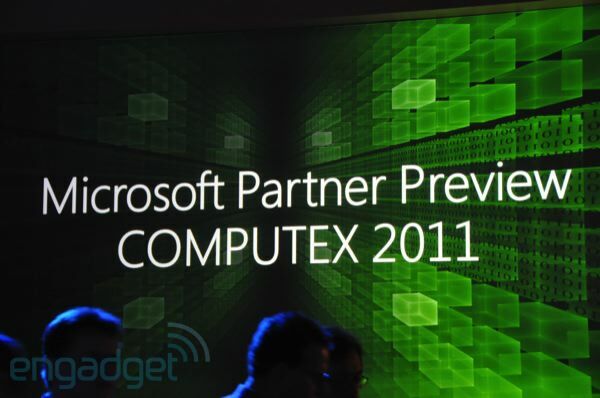 Live from Microsoft's Windows 8 preview event at Computex 2011! 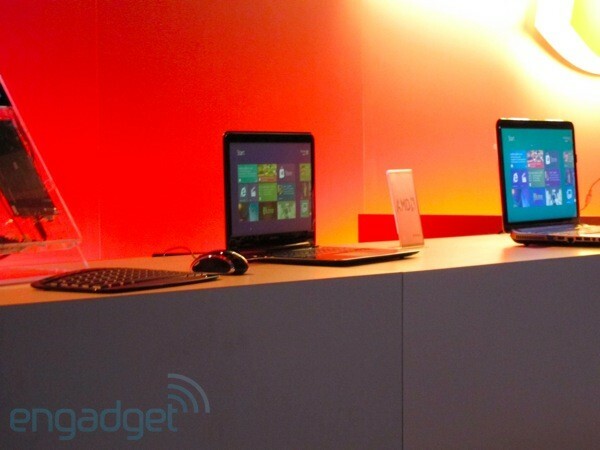 Microsoft finally debuted the next version of its Windows operating system, codenamed Windows 8, at D9 earlier today, and now it's hitting up Computex over in Taipei with a partner preview event. 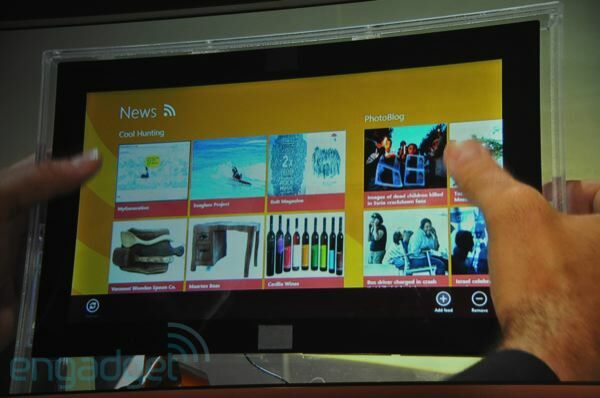 We don't know quite what will be revealed here, but the new Win 8 UI has a touch-friendly look designed specifically to make tablet users feel more at home, so a peek at new slate hardware might not be completely out of the question. 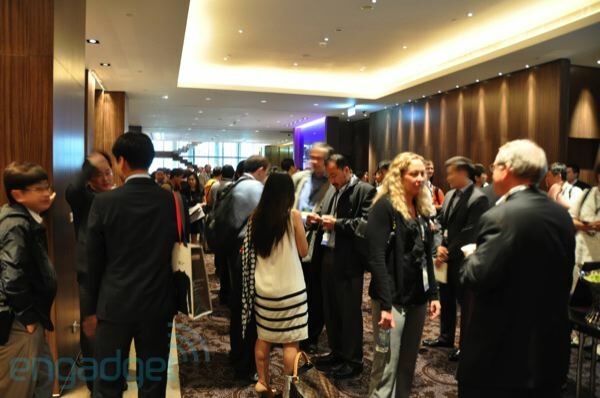 Join us after the break for all the live updates from the event. 10:52AM And that's that. Let's go and see if we can't get to handle those dev machines! 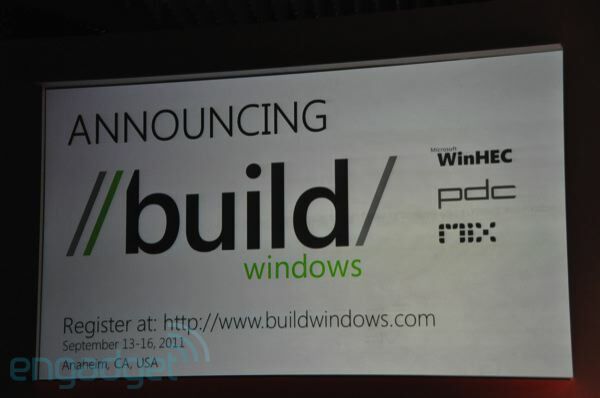 10:52AM The Build conference in September will have "everything" about Windows 8. 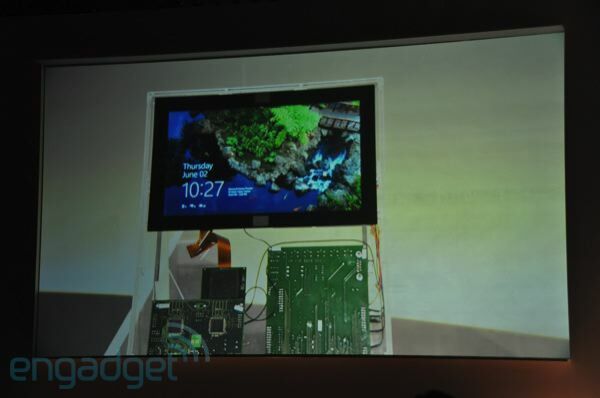 10:51AM Evidently, Microsoft is taking a more active role in pushing the hardware for Windows 8 devices forward. 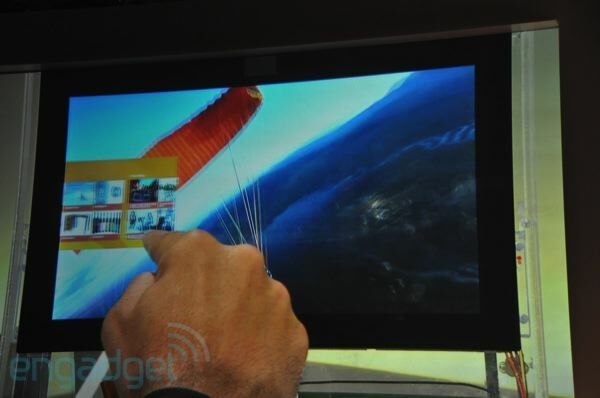 10:51AM "We have some recommendations on bezel sizes so you can easily hold the system" while also being able to use it comfortably. 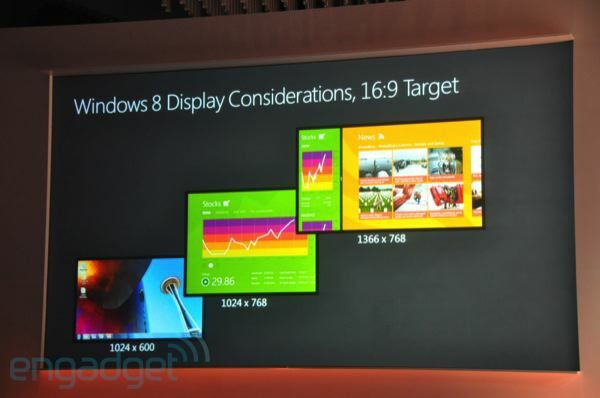 10:50AM Minimum of 1366 x 768 resolution for the best Windows 8 experience. 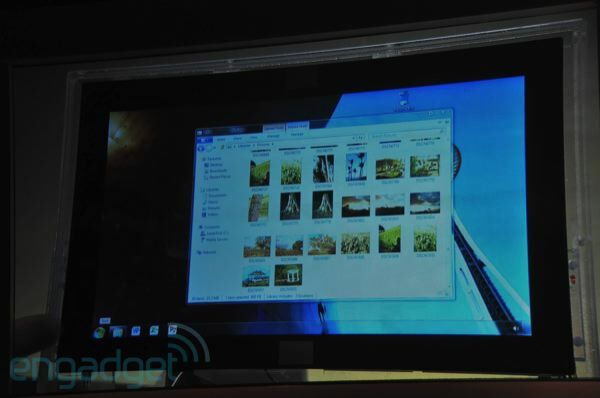 1024 x 768 will be the absolute minimum for the new UI fanciness and 1024 x 600 will let you run Windows 8 in the classic desktop mode. 10:49AM Supporting a whole range of new sensors as well. 10:49AM UEFI engagement will help with speeding up boot times. 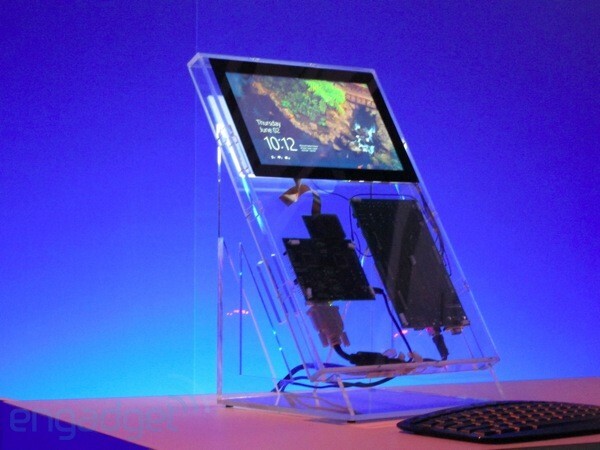 "I've seen systems with SSDs inside them that can go from a cold boot to the Start screen in under 6 seconds." 10:48AM OEM Activation 3.0. 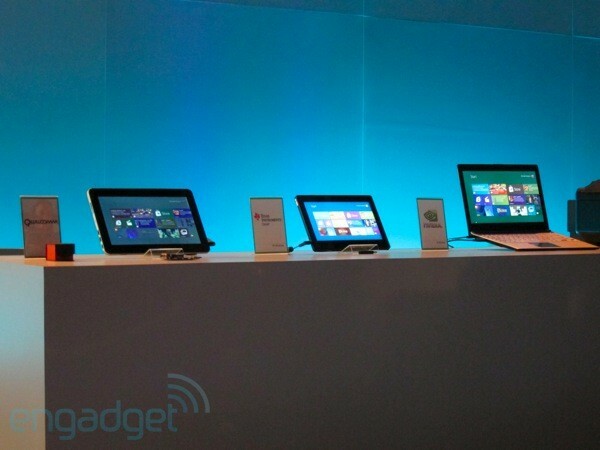 A seamless activation experience for end users and it'll streamline things for hardware partners. 10:47AM "From day one, we started engineering these systems with a much closer integration of hardware and software than ever." 10:47AM He's pointing out that whether you're running x86 or ARM, you'll be enjoying the same apps. 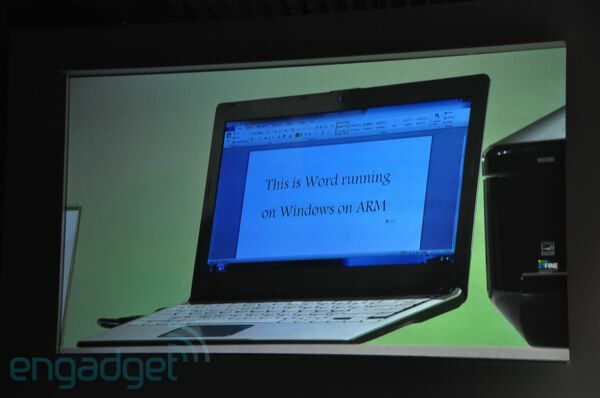 10:46AM "The same app, completely cross-platform, based on the Windows 8 application development platform." 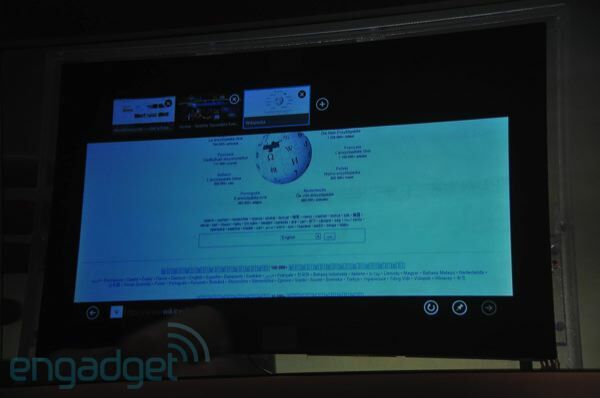 10:46AM Hardware-accelerated HTML5 shown off on the dev Kal-El tablet. 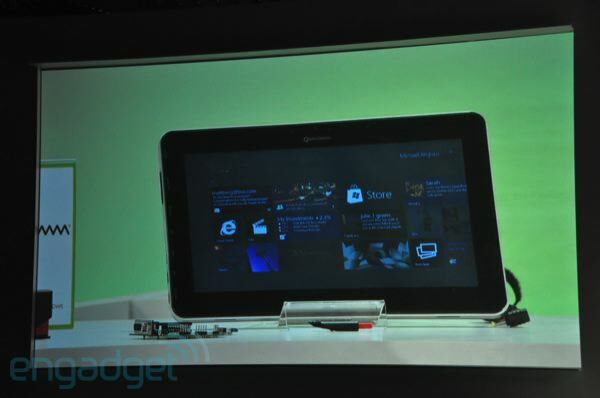 10:45AM And now a tablet with the same super-powered chip. 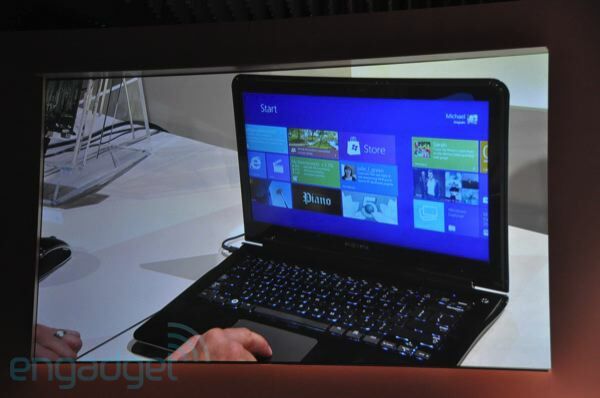 10:45AM Woah, a skinny laptop running NVIDIA's quad-core Kal-El chip! 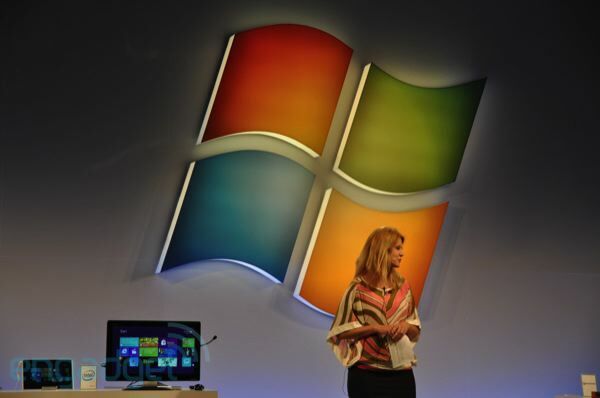 10:44AM "You can build them virtually any size and shape, all being able to run Windows." 10:44AM Showing a USB stick connected to one of the dev devices and shows that it works just as it does on the desktop. 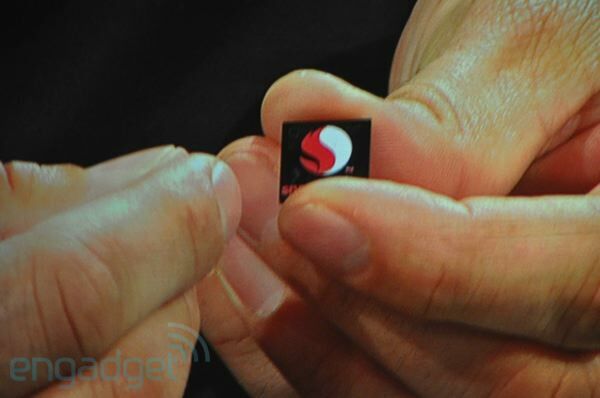 10:42AM Mike also showed us a Snapdragon system-on-chip just so we know teeny tiny these things are. 10:42AM A new mode called "always on, always connected." 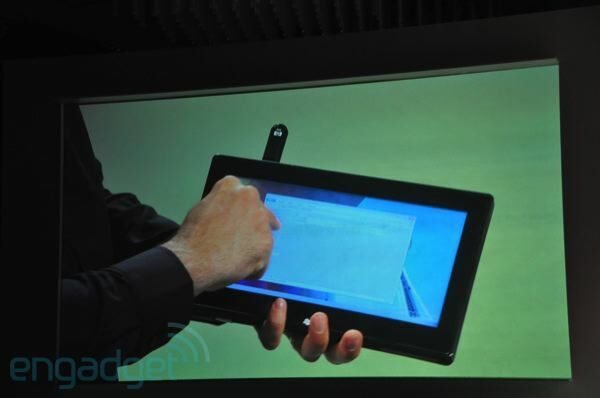 It'll permit for instant wake-up from sleep and keep the ARM tablets constantly connected to the web. 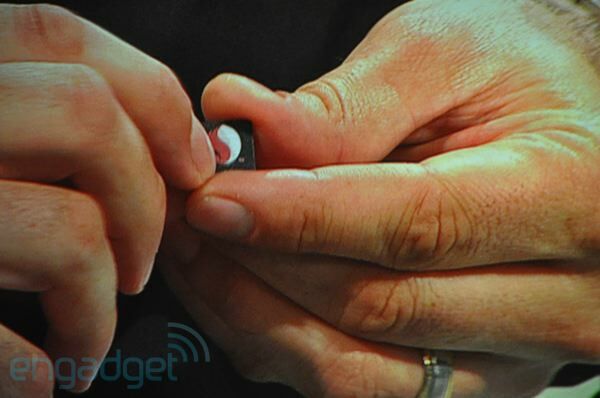 We're also promised great battery life. 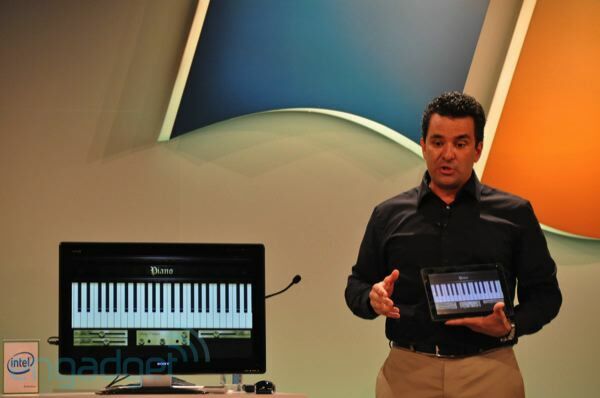 10:40AM We saw motherboards back at CES, now dev devices. These won't ever be on sale, but it shows progress. 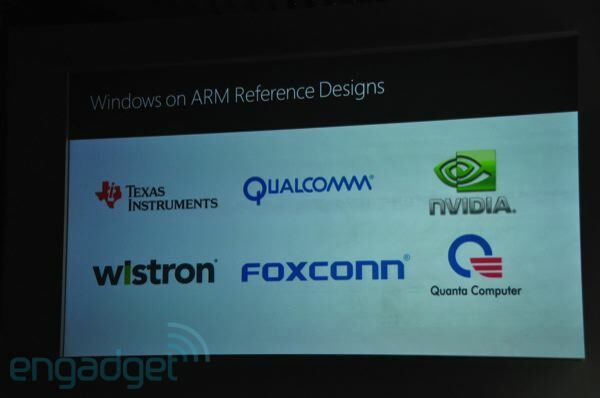 10:40AM Qualcomm, NVIDIA and TI developer reference systems for Windows 8 on ARM. 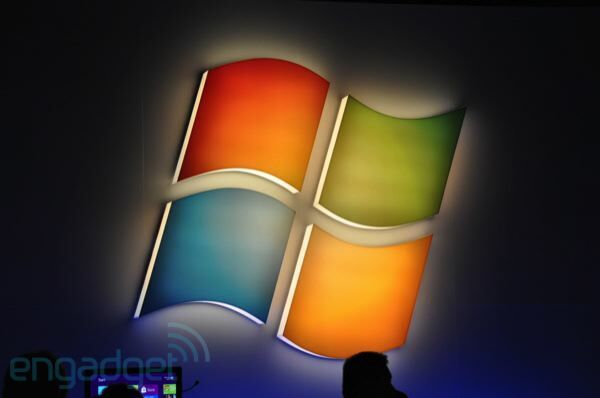 10:39AM "Not multiple versions of Windows, just one version of Windows running on all of them." 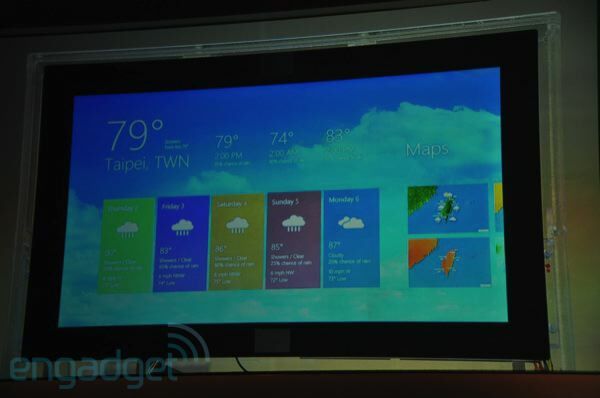 10:39AM "With or without touhscreens, with or without keyboards, the full Windows experience." 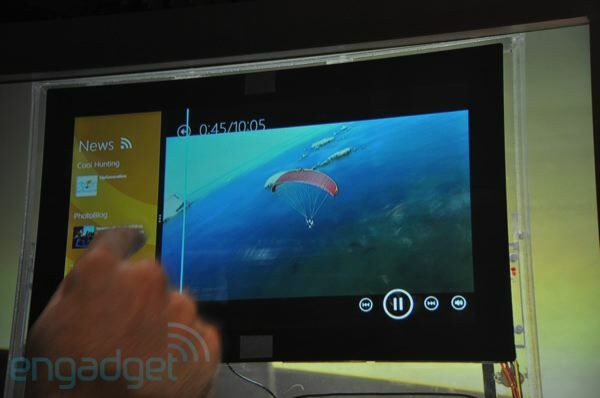 10:39AM Windows adapts to it by launching apps in full screen instead of side by side as on the widescreen diplays. 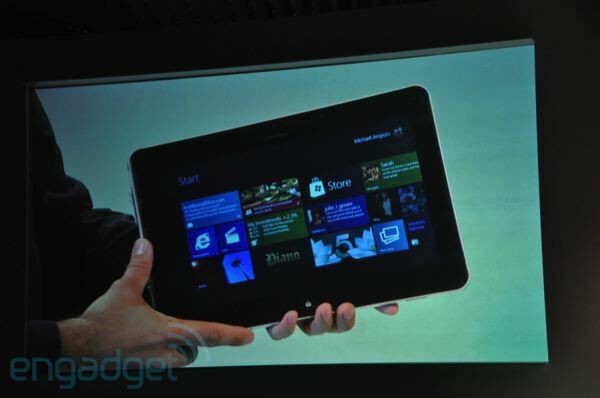 10:38AM Now also showing Windows 8 on a tablet that doesn't have a 16:9 display resolution. 10:38AM "The Llano processor that's coming out this quarter." 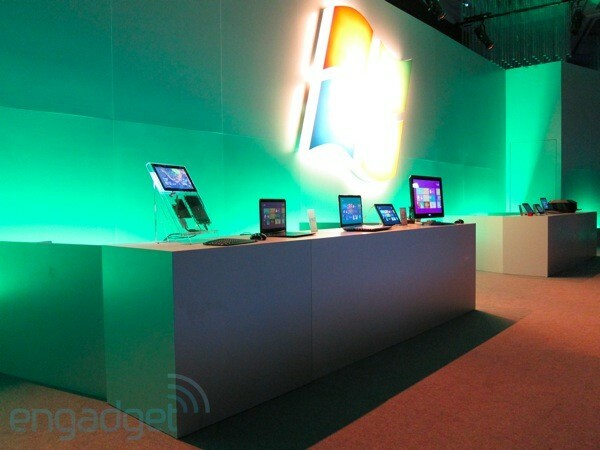 We already kind of knew that, but good to have confirmation, Microsoft! 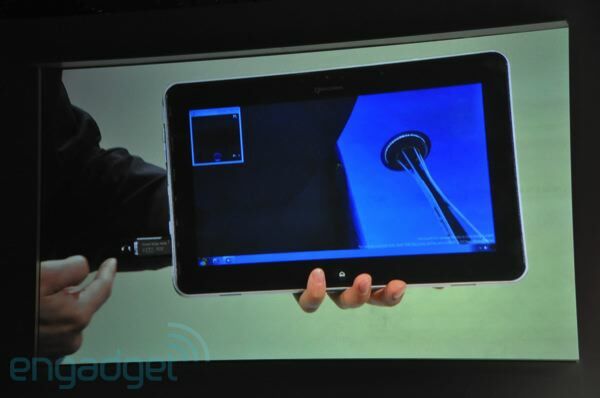 10:37AM Showing an HP dv6 will AMD Llano inside. Hah! 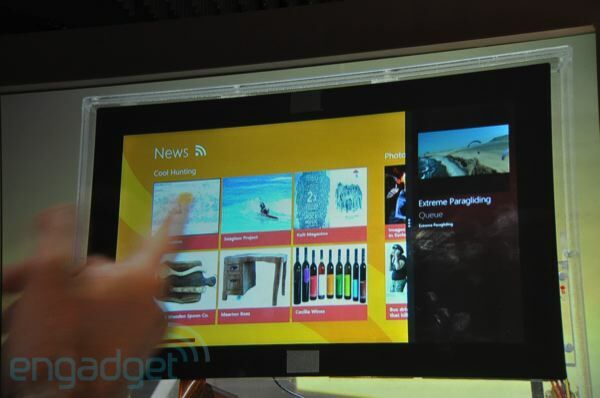 10:37AM PageUp and PageDown buttons will allow you to move between tiles on non-touchscreen devices. 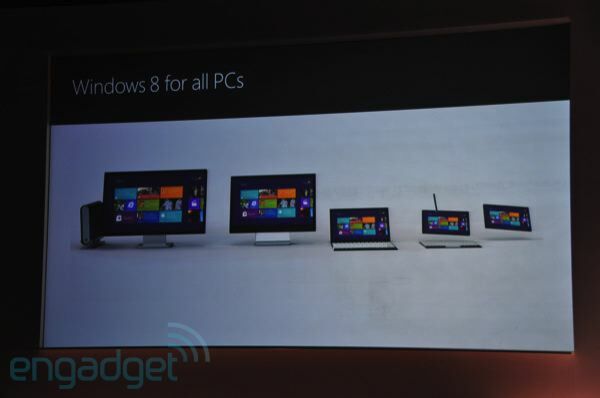 10:36AM "Windows 8 is an upgrade for the entire ecosystem of PCs." 10:36AM "How is this going to work on all the other systems?" 10:35AM 1366 x 768 resolution on that Dell system. 10:35AM You can also do a split-screen interface, where you see both the new and the old UI side by side. 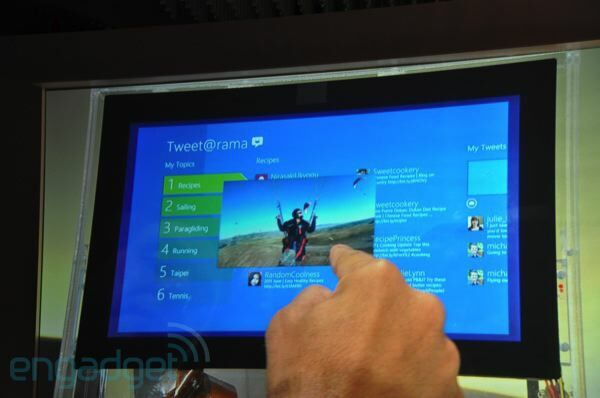 10:35AM The big difference with Windows 8 is that when you get into the apps, they're all optimized for touch. 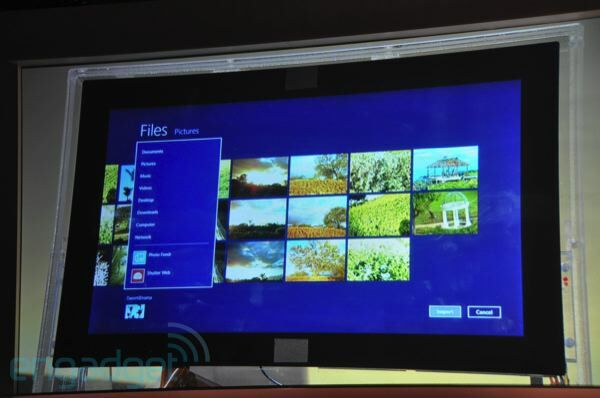 10:34AM Switching between the live-tile UI and the usual desktop is instantaneous. We're seeing some seriously impressive performance here. 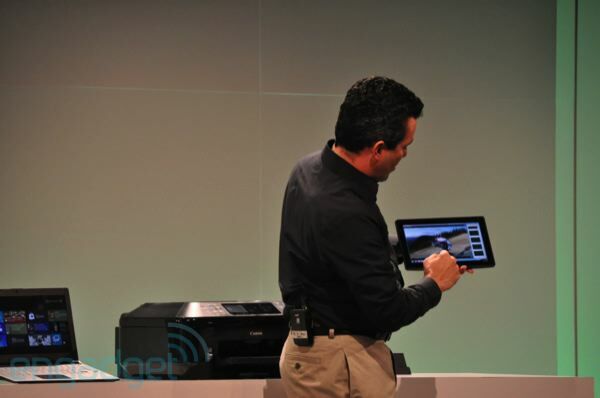 And it's all done on that Dell XPS proto system. 10:34AM Now he brought us back out into the familiar Windows desktop. 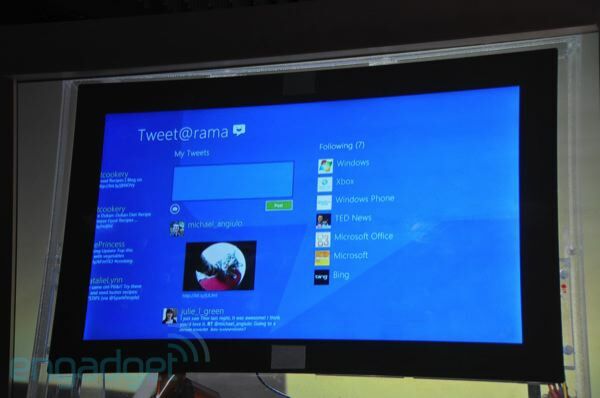 It looks identical to the current Windows 7 desktop UI. 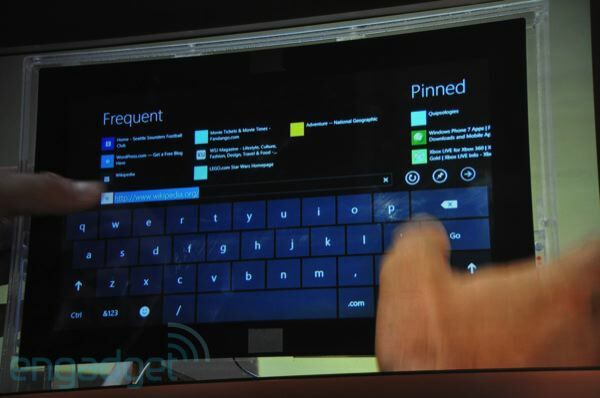 10:33AM There's a look at the onscreen keyboard, which is identical to the nice one in WP7. Also a split version that we saw earlier at d9. 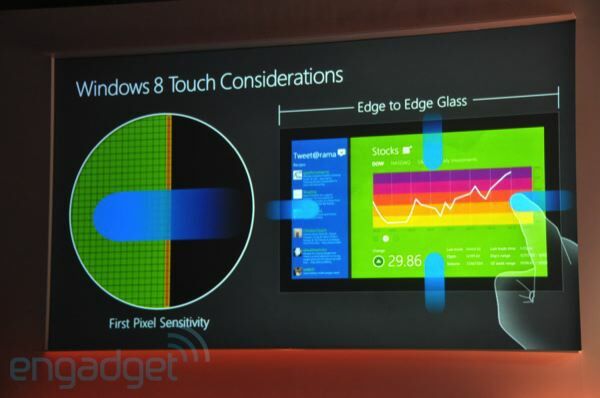 10:32AM "A browser optimized for touch. Optimized for panning and zooming." 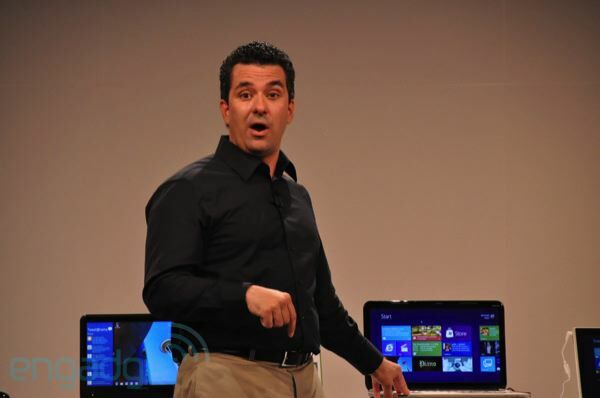 10:32AM "With Windows 8, we're gonna be introducing IE 10." 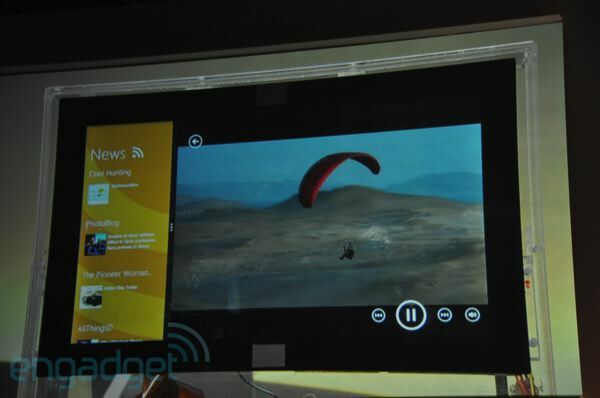 10:32AM "Real multitasking" demonstrated, where a video plays back while you negotiate your way around other apps. 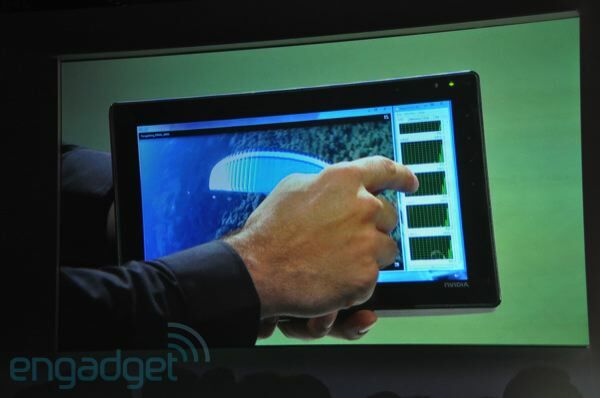 Frankly, Windows has always been able to do that, but this is indeed pretty swanky when it comes to tablets. 10:31AM The full screen experience is designed for 16:9 widescreens. 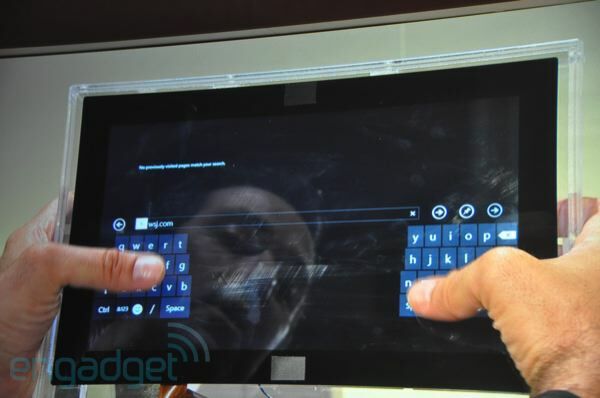 10:30AM And if you're holding a tablet, all the controls are right under your thumb. 10:30AM Woah, you can switch between apps by just dragging them in from the side. 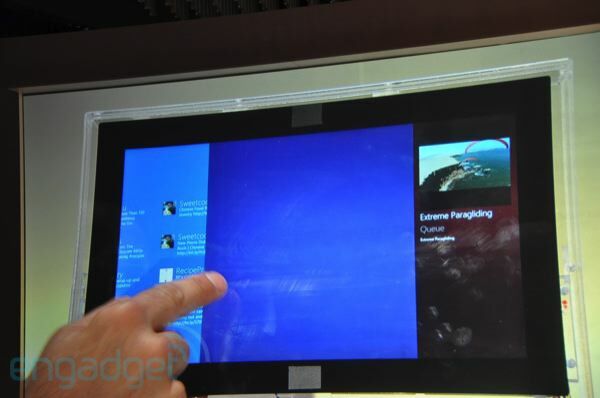 10:29AM Swiping in from the side brings in a sub-menu that looks equivalent to the taskbar in the current Windows. 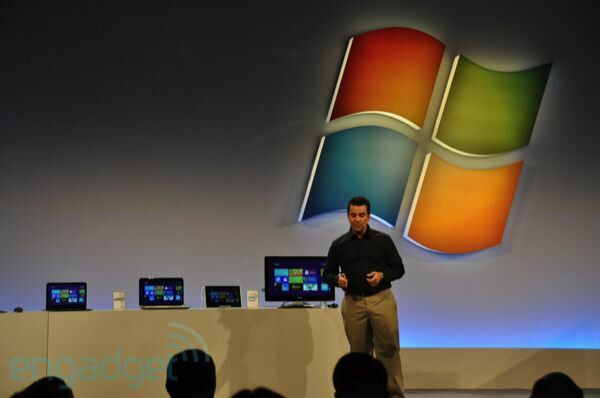 10:29AM "On day one, when Windows 8 ships, hundreds of millions of developers will already know" how to develop for it. 10:28AM "The first thing you notice is that the apps are chromeless, they immediately take up the whole screen." 10:28AM Notifications, new tweets, new email, "it's all presented to you immediately without having to take that extra step." 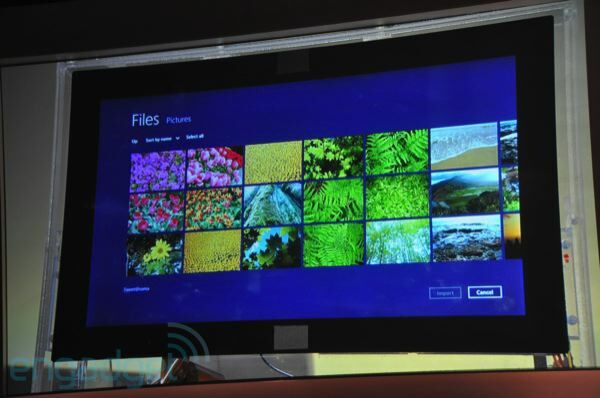 10:28AM The tiles that you see on the Start screen are live. "They represent your apps, your people, your contacts, the things that you care most about." 10:27AM Log in by swiping up on the lock screen and you're right into the Start screen. 10:27AM A Dell XPS development station. 10:27AM Here comes a look at the hardware on stage. 10:26AM The devices we use to connect to the web have changed. "Thinner and lighter, resume from sleep immediately... some of them have batteries that run for weeks on end." 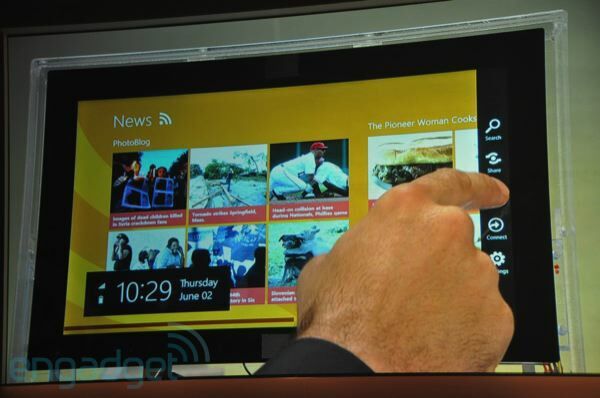 10:26AM Today, we're facing trends to do with immersive experiences, touchscreens, and the web. 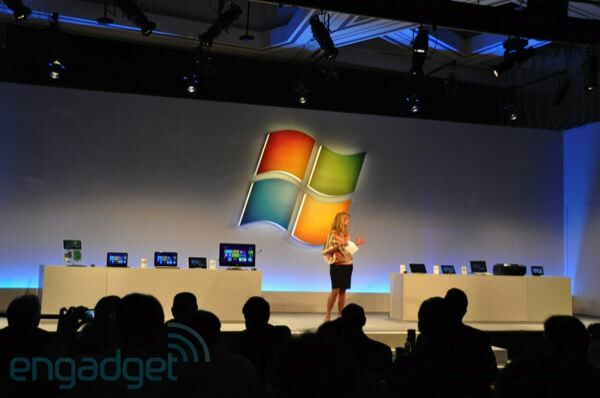 10:25AM When Windows 7 was being designed, the trends were around ultra-portable notebooks, which is why it was made to run so efficiently. 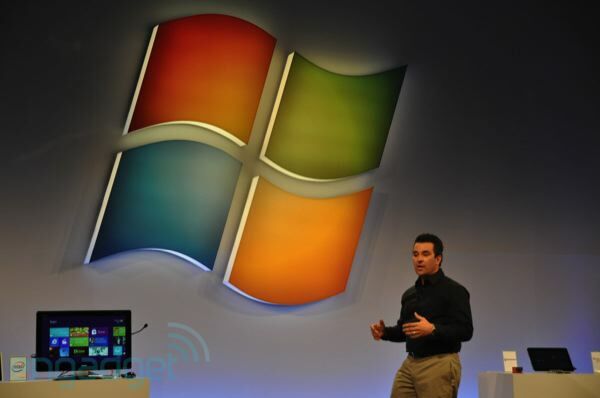 10:25AM "Windows has continuously adapted" to new trends and development in the industry. 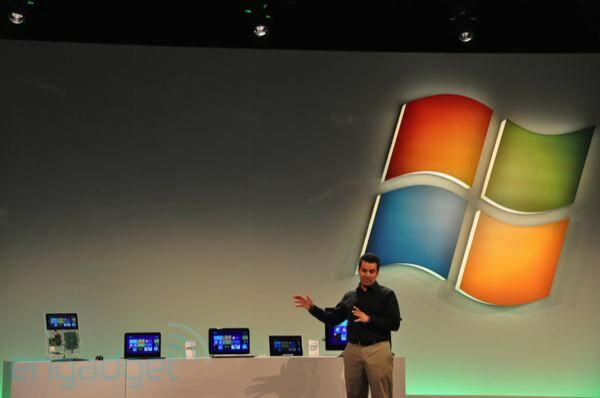 10:24AM Mike: "I'll begin with a little bit of background on some of the decisions behind Windows 8." 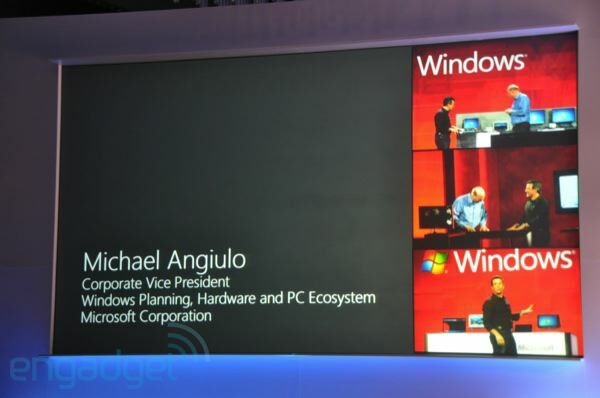 10:24AM Here comes Mike Angulo, who is responsible for Windows planning and Microsoft hardware. 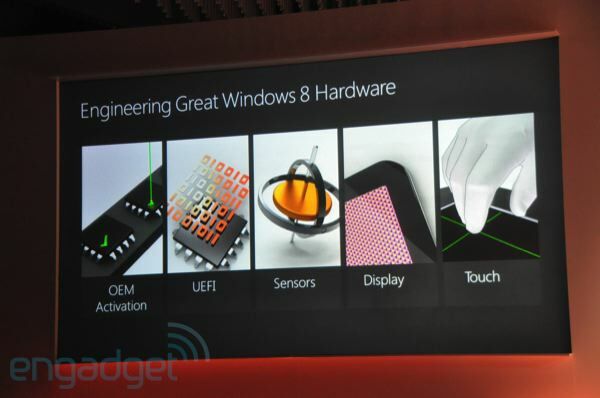 10:23AM Big thanks expressed to the hardware manufacturers working with Microsoft. 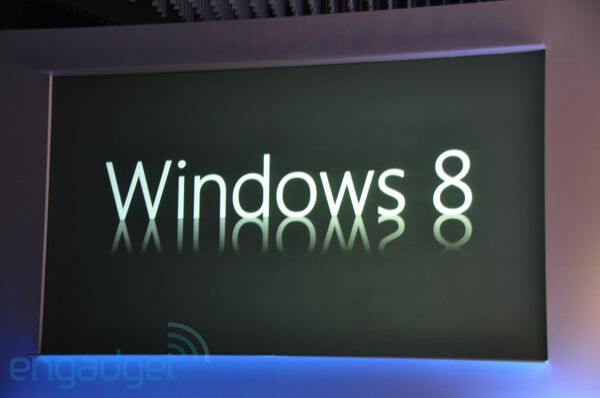 10:22AM "We refer to the next version of Windows internally as Windows 8." 10:22AM "An update on the next version of Windows." 10:20AM The event will begin in one minute. 10:19AM Yes, there are some extremely skinny notbooks on show too. 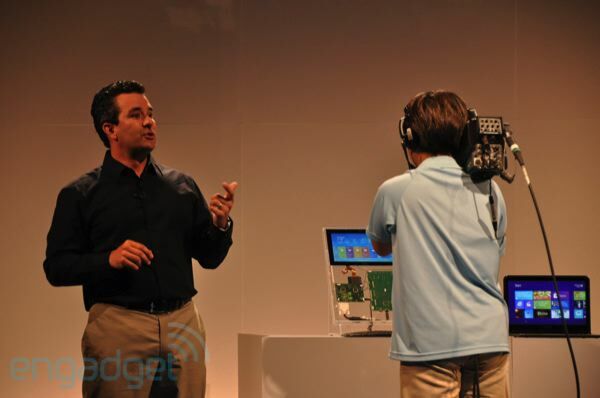 10:15AM It seems we're on the brink of being shown the first Windows 8 ARM devices. 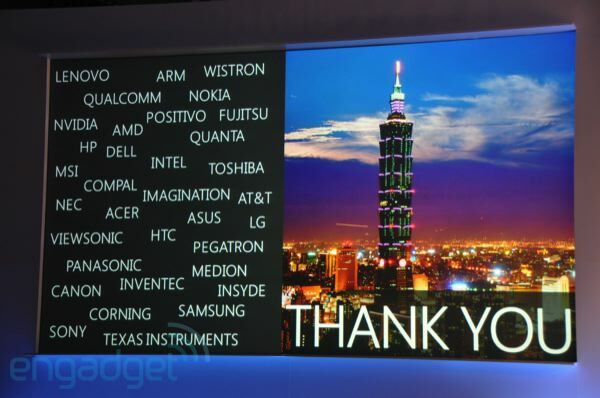 10:14AM Intel and AMD placards are joined by Qualcomm, Texas Instruments and NVIDIA! 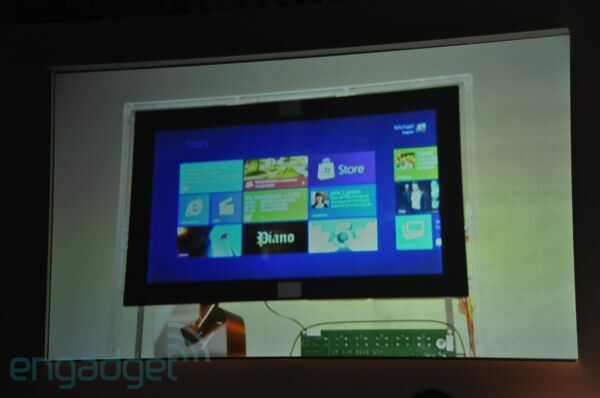 10:10AM We're seeing tablets and monitors up on the stage, both featuring the new tile UI of Windows 8. 10:08AM And yay, the doors have opened, we're in! 9:56AM We're just about to be let into the event venue, high up in the swanky W Hotel.